The concentric circles are a follow-up to Stephen Few's “bricks”. He meant to address the difficulty of reading quantities displayed in circles, but ran into problems when his bricks would overlap. My proposal is less ambitious and means solely to improve on the circles. It seems to me that the main issue with plain circles, the one that Few is addressing with bricks, is that they barely send a signal when they grow. 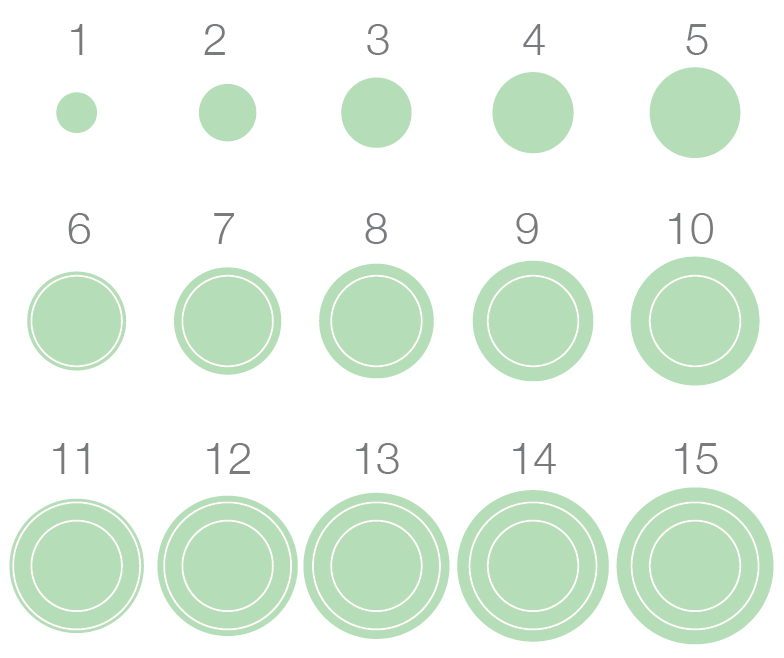 A circle representing 8 units looks a lot like one representing 7 or 9 units. In addition, basic geometry tells us that if a circle doubles in diameter, its area grows more than four-fold. Most readers of graphs do not intuitively grasp the magnitude of this relationship. To address this issue, concentric circles add white lines at equal intervals to a solid circle. The lines act like gridlines on a column chart, providing a visual clue to the crossing of a certain threshold. The concentric circles also have the advantage of showing how difficult it is to eyeball areas. Without the gridlines, few people would realize that circle 10 is twice the size of circle 5. 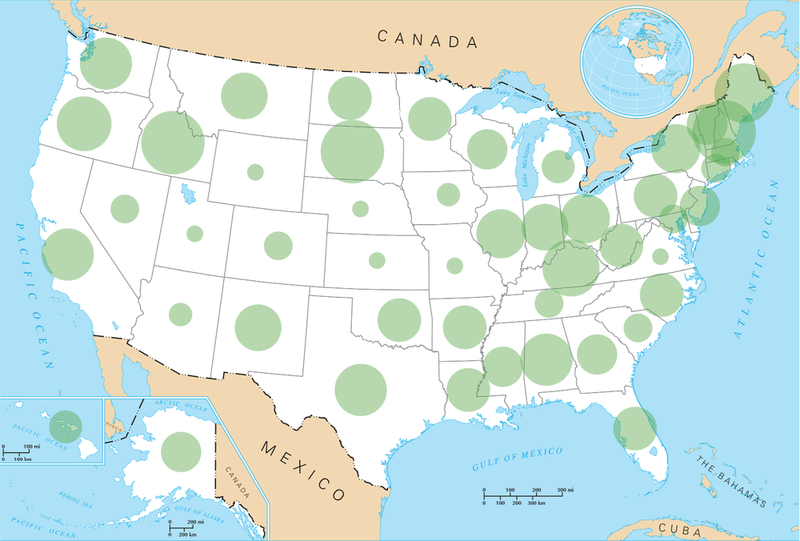 Here are the concentric circles on a map, a situation where plain circles are often used. So, which one seems clearer? For testing purposes, compare Texas and Louisiana. Washington and Oregon. Oklahoma and New Mexico. In these cases, the circular gridlines help the reader establish which one is larger, something he can’t quite do with the plain circles. This is part of a larger, ongoing conversation about data visualization methods that address the shortcomings of the human eye and brain. Here's hoping that concentric circles can help a little, if only to inspire. For the complete genesis of the concentric circles and the feedback from Stephen Few (spoiler alert: he doesn't like them), see the three blog posts.